Back in May, Funko announced a new 5 Star series of figures that includes three points of articulation and additional detail not featured in their Pop! series. The first of the bunch were a bit on the safe side, but now they’ve announced the first 5 Star Horror set, which includes A Nightmare on Elm Street dream demon Freddy Krueger and more. Also included in this set is Chucky from Child’s Play, Pennywise the Dancing Clown from IT, and Jason Voorhees from Friday the 13th. The new figures also come with some awesome accessories, a new feature boasted by the Funko 5 Star line. The new Funko 5 Star Horror figures are posable, allowing you to reenact their most terrifying moments and actions with the use of accessories, including a paper boat, red balloon, claws, and variety of other bloody weapons. Each figure costs $10 and will be available this October, just in time for Halloween. The new 5 Star figures are a bit more detailed than their Pop! cousins, but they still retain that cute factor as well, so you don’t have to worry about displaying these bad boys if you have small children around the house. The new Funko 5 Star figures are aimed at collectors with a passion for creatively displaying their figures. Collectors can now capitalize on the ability to use the 5 Star figures’ different poses, use different accessories, and even the packaging to create a unique tableau or diorama that continues the narrative adventure. Each of the new horror figures, as well as the rest of the 5 Star line come in unique packaging which opens up like a book, so fans can even leave the figures inside the box to display if they please. The first of the Funko 5 Star sets was based on the massively popular Harry Potter franchise. In addition to the new horror figures and Potter run, the company also announced special 5 Star edition for the 25th anniversary of Tim Burton’s The Nightmare Before Christmas. The absolutely massive set comes out next month along with a ton of other Funko products, which includes the traditional Pop! figures as well as keychains and plush toys. There are also limited edition figures that will be available exclusively at Hot Topic stores. As of this writing, the Freddy, Jason, Chucky, and IT killer clown Pennywise 5 Star Horror Figures are not limited edition and will be available everywhere Funko products are sold. Horror fans can now reenact the epic Freddy vs Jason battle and even start new wars between Chucky and Pennywise the Dancing Clown, who seem like they would be a good match for each other. The latest Funko announcement comes just days after the company revealed another set of horror figures that are based on the He-Man action figure body type. Freddy, Jason, Leatherface, Michael Myers, and Hellraiser are all a part of the Savage World line of toys and come with extensive accessories to kick off a full-scale action figure war. 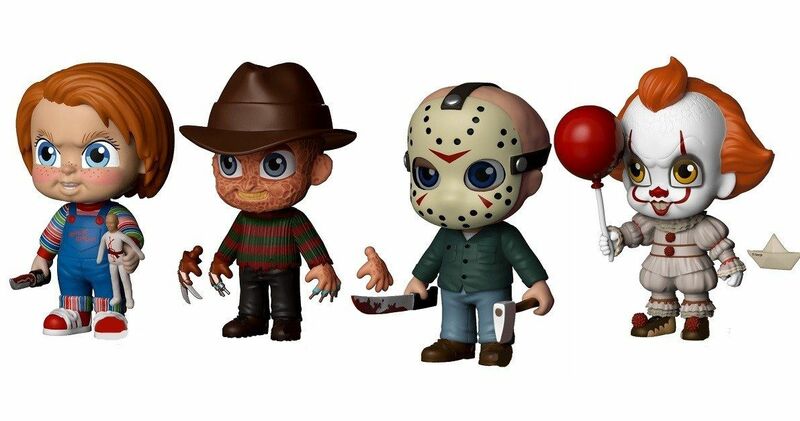 You can read more about the new Funko 5 Star Horror figures at Funko Blog.